Olbermann: "Which of these stories will you be talking about tomorrow? 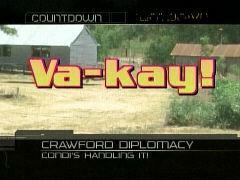 Va-kay! In light of increasing hostilities between Israel and Hezbollah, British Prime Minister Blair cancels his vacation. The President starts his." George W. Bush: "The humanitarian crisis in Lebanon is of deep concern to all Americans, and alleviating it will be a priority of my government." 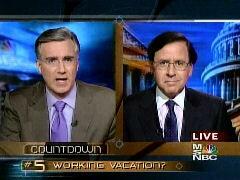 Olbermann: "He's on vacation. The war itself: Is he dealing with foreign heads of state in hopes of bringing an end to the now 27-day conflict?" Bush: "Condi's handling those conversations, and she's doing a fine job of doing so." After the teaser, Olbermann opened the show by harkening back to Chamberlain's failed dealings with Adolf Hitler and his obliviousness to the outside world while on vacation: "On August 4, 1939, the prime minister of Great Britain, Neville Chamberlain, adjourned the British parliament and ordered it reconvened on October 1st. He went on vacation. Eighteen days later, the Russians and Germans signed a non-aggression pact removing the last obstacle to the Nazis rolling through Europe. When Chamberlain was located by his secretary, he was knee-deep in a river fishing. When the secretary told him that Hitler and Stalin had just cut a deal, Chamberlain told him, 'You must have gotten that wrong somehow.' Chamberlain was on vacation. World War II started nine days later." As Olbermann covered Democratic Senator Joseph Liebermann's troubles with anti-war Democratic voters in Connecticut's primary, Olbermann referred to Bush's foreign policy being in pieces: "Condi Rice, Secretary of State Rice not the only one picking up the pieces of the President's foreign policy. Democratic Senator Joe Lieberman now facing the prospect of losing tomorrow's primary vote in Connecticut, thanks in part at least, to his staunch support for keeping U.S. troops in Iraq." After bringing aboard Newsweek's Howard Fineman to discuss the day's news, Olbermann started off by asking if it was a "cheap shot" to bring up Bush's vacation, while Fineman supported Olbermann's concerns and charged that Bush has a spotted history with vacations. Fineman: "Don't forget in 2001 he got that famous warning about the possible attack of al-Qaeda and Osama bin Laden's interest in attacking the United States just a month before 9/11. And then last year, during Katrina, there was evidence that he wasn't really on his game and really vigilant the way he should have been, as early as he should have been, and he paid a lot politically for it." Keith Olbermann, in opening teaser: "Which of these stories will you be talking about tomorrow? Va-kay! In light of increasing hostilities between Israel and Hezbollah, British Prime Minister Blair cancels his vacation. The President starts his." Olbermann, opening the show: "Good evening. On August 4, 1939, the prime minister of Great Britain, Neville Chamberlain, adjourned the British parliament and ordered it reconvened on October 1st. He went on vacation. Eighteen days later, the Russians and Germans signed a non-aggression pact removing the last obstacle to the Nazis rolling through Europe. When Chamberlain was located by his secretary, he was knee-deep in a river fishing. When the secretary told him that Hitler and Stalin had just cut a deal, Chamberlain told him, 'You must have gotten that wrong somehow.' Chamberlain was on vacation. World War II started nine days later. Our fifth story on the Countdown, depending on how you parse it, there barely is or barely isn't a civil war in Iraq, and the intensity of the conflict between Israel and Hezbollah continues to spiral upwards. But President Bush, right on time, started his vacation today. His close ally, Tony Blair, avoided the direct Chamberlain comparison and cancelled his own time off because of the events in the Middle East. But the President went to Crawford, Texas today anyway. There he announced two new United Nations resolutions to end the conflict perhaps while making it clear he is not actually involved with a lot of the diplomatic legwork that is needed to make either resolution stick, like actually talking to the leaders of Lebanon and Israel about it." Sheryl Gay Stolberg, New York Times: "You have spoken with Prime Minister Blair and Chancellor Merkel about this? Have you spoken directly with Prime Ministers Olmert and Siniora? And if not, why not?" Bush: "Because Condi's handling those conversations, and she's doing a fine job of doing so." Olbermann: "Is it more than a cheap shot to say the President's on vacation? Is it even possible to stop Israel and Hezbollah without the President at least giving the appearance of being involved in the process?" Howard Fineman, Newsweek: "Well, I don't think it's a cheap shot, although the White House is trying to tell everybody that this is a much shorter vacation than ones he's taken in the past, more like a campaign year. It's that much of an emergency. But the key thing is not how many days he spends in Crawford, it's what he does or doesn't do when he's there. Unfortunately for him, his Crawford record of vigilance is not that terrific politically or substantively. Don't forget in 2001 he got that famous warning about the possible attack of al-Qaeda and Osama bin Laden's interest in attacking the United States just a month before 9/11. And then last year, during Katrina, there was evidence that he wasn't really on his game and really vigilant the way he should have been, as early as he should have been, and he paid a lot politically for it. Now you got the combination of him being down in Crawford while at the same time saying that he's not talking to the two most important leaders in the Middle East conflict right now, the leaders of Israel and Lebanon." Olbermann: "In the context of the PDB from 2001 and Katrina from 2005, we know that every few weeks the White House tries to change the delivery of the message or how the message is received or to blame reporters about the message. Does anybody there believe in history? Would somebody say to Mr. Bush, 'Hey, you know, it would mean something, at least symbolically, if you delayed this trip even by a couple of days if there was some sense that it was not business as usual'?" Fineman: "There may be some people who might say that to him. They're not in his inner circle. Some measure of August vacation in Crawford is sacrosanct with George W. Bush. They think they've made a big sacrifice. He thinks he's made a big sacrifice by having it only be about 10 to 11 days and not the nearly month that he sometimes takes and would prefer to take. They're not going to say it to him. This is a guy who operates sometimes stubbornly by delegation, who operates on a rhythm, who cares very much about routine, and he's not going to change, and I daresay most of the American people have already come to a conclusion about the character and public persona of George W. Bush. They either like him loathe him, and that's really not going to be changed by the number of days he spends in Crawford."